Is input or motion control the weakest link in your 3D experience? Are you using outdated 2D input devices for 3D applications like Second Life and World of Warcraft? Are you looking for that competitive edge in your gaming? For the first time, you can move along and rotate about the x, y, z axes (forwards, backwards, sideways, pitch, yaw and roll) using only a mouse without having to use your keyboard. To see a graphical chart of the different movements, click here. 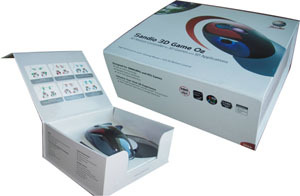 The world's first 3D Laser Mouse is an integration of a full 3D 6DOF motion controller with a top-of-the-line traditional 2D mouse. It is designed to enhance the 3D experience in 3D Internet applications and many of the best 3D games by giving the user a full range of control in one hand. Experience 3D Environments the way they were meant to be! 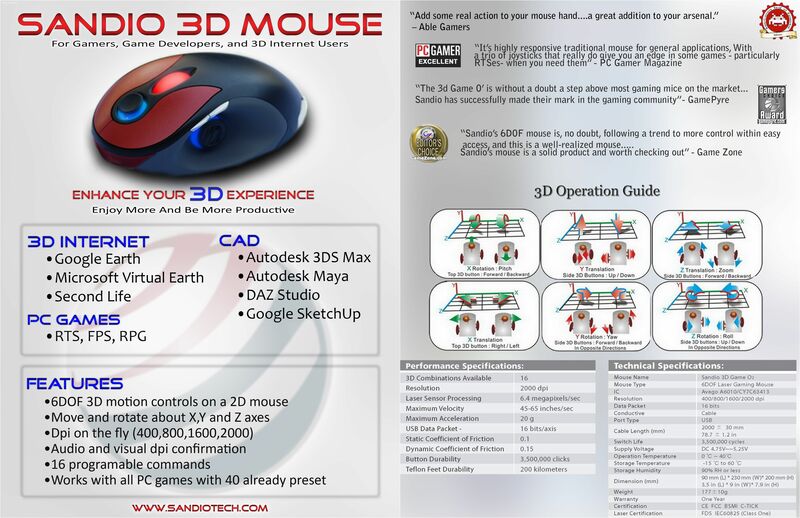 The Sandio 3D Gaming Mouse includes more than 40 pre-programmed PC game configurations. 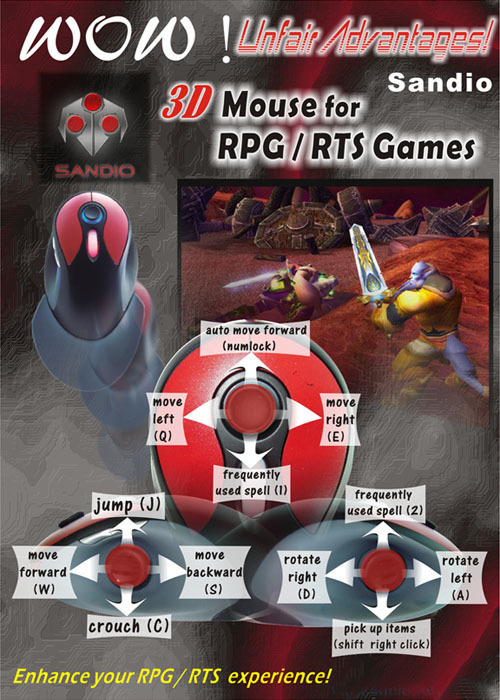 With 3D Input Management Software, users can customize the Sandio 3D mouse to enjoy more, and maybe to gain some unfair advantage, on all RTS, RPG and FPS games. Use the Sandio Game O2 for navigation and the keyboard for hot keys. You can free the left hand for game commands instead of switching between navigation and hot keys. OR use the keyboard to navigate while using the 3D mouse buttons for hot keys. Adapt the mouse to your gaming style! Your imagination is the limit of how you tailor the mouse to fit your gaming needs! The operation of the Game O2 3D Mouse is easy. Objects and camera views change in the same direction as simple finger gestures. The object or camera view moves forward when the user pushes, backward when they pull, and turns when they twist their fingers. The detachable glide plate enables you to relax and rest your hand completely without contact with your mousing surface. The large teflon glide surface enables extremely smooth movement at all DPI settings. Users can assign up to 16 desired commands to the programmable buttons. To see an example of how this can enhance your gaming experience in World of Warcraft click here. 3D Gaming - Bring 3D to a new level of reality with fingertip control of your character for quicker response and more realistic feel. 3D Production Applications - True 3D control enables a new freedom in 3D applications. Free up a hand for keyboard or writing while enhancing your onscreen control.